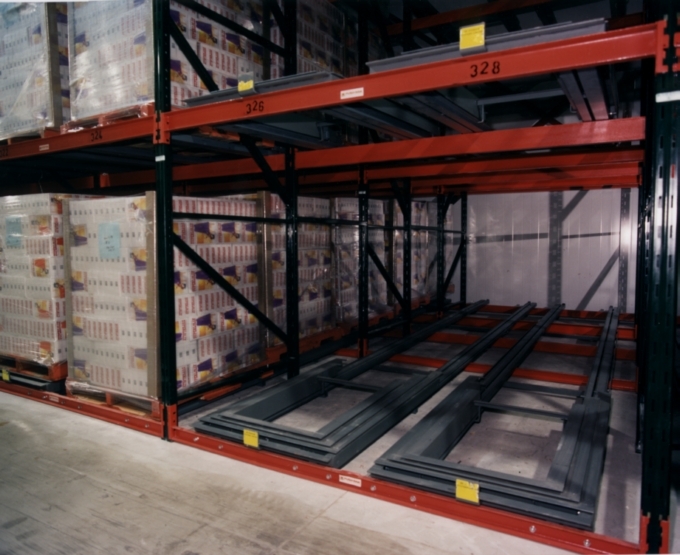 Push back Racks offer the same storage density as drive-thru racking but greater selectivity. 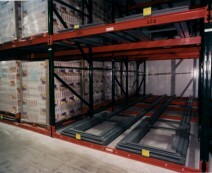 All loads are stored and retrieved from the aisle and rest on a cart on a rail that slopes gently toward the front. When a new load is deposited into a lane, it ‘pushes back’ the one already at the face of the aisle and all those behind. Then, when that load is picked, the contents of the lane all move gently forward again, hence the term “push back rack”. Push back systems can be designed to be as much as 5 pallets deep depending on heights, load weights, and the type of lift truck being used to interface. The carts that the loads sit on are nested and often provide a lift truck operator with indication or signalization of whether there remain any further positions available within a given chute or lane. This makes it a great choice for when inventory or product needs to move fast – last in and first out.